FORTVILLE — Students at Mt. 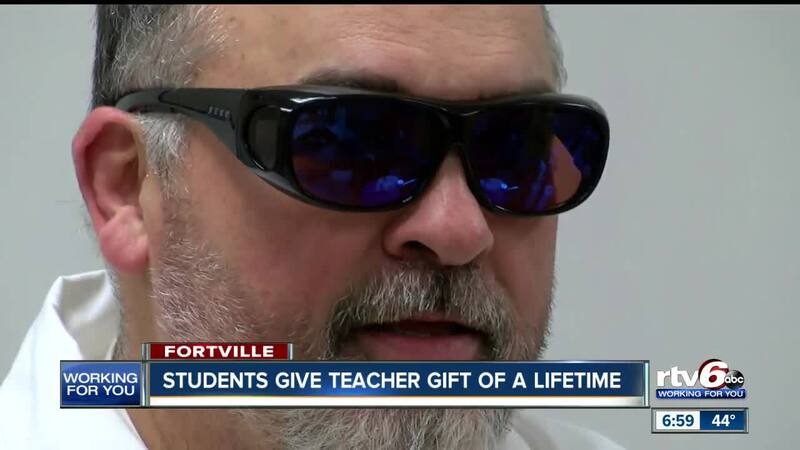 Vernon High School raised enough money to surprise their biology teacher, who is color blind, with a Christmas present he’ll never forget. Dennie Mitchell teaches biology and is beloved by his students. As a special Christmas surprise, those students got together to raise money to buy Mitchell something that would change the way he sees the world – literally. One of Mitchell’s students, David Bundy, organized the whole thing. “I knew that the glasses existed and when I looked them up, it looks pretty pricey, so I thought I might get some help,” Bundy said. The students raised more than $300 to buy the enchroma glasses that improve the way people who have color blindness see colors.